The mission of VietAbroader is to empower Vietnamese youth to contribute to the sustainable development of Vietnam. We organize educational and professional programs to equip Vietnamese youth with knowledge and a support network for their academic and professional developments. VietAbroader is a diverse community that promotes openness and appreciation towards all individuals and groups. VietAbroader fosters an inclusive environment where all members, regardless of socio-economic backgrounds, are encouraged to interact and participate in intellectual and cultural discourse. 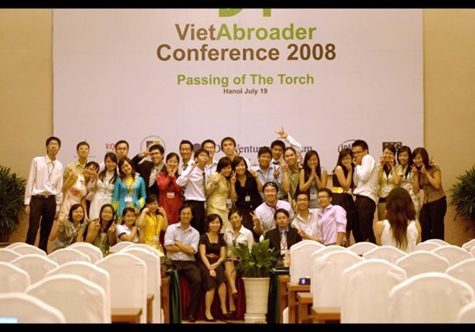 VietAbroader comprises Vietnamese students of the highest caliber from around the world who have demonstrated the greatest potential for contribution to Vietnam. VietAbroader is a member-driven organization. Our niche is in having more experienced members share their strategies for success with younger members, be it in college admissions, college life or professional development. Amherst College, Babson College, Bates College, Bowdoin College, Brandeis University, Brown University, Bryn Mawr College, Cambridge University, Colgate University, Colby College, Dartmouth College, Davidson College, DePauw University, Drexel University, Duke University, Franklin & Marshall College, Gettysburg College, Lake Forest College, Grinnell College, Hamilton College, Harvard University, Hendrix College, Lawrence University, Lehigh University, MIT, Mount Holyoke College, National University of Singapore, New York University, Northwestern University, Quinnipiac University, Princeton University, Smith College, Stanford University, St. Lawrence University, Swarthmore College, Trinity University, University of Oxford, University of Pennsylvania, University of Virginia, Wellesley College, Wesleyan University, Williams College, WPI and Yale University, among many others. AIG, BBC, Bloomberg, Citi, Deloitte, Facebook, FPT, Goldman Sachs, Google, HSBC, IDG Ventures, Insight Venture Partners, IIE, Intel, JP Morgan, LIN Center for Community Development, Merrill Lynch, Microsoft, Morgan Stanley, Ogilvy, UBS, United Nations, NERA Economic Consulting, Openview Venture Partners, SamSung, SiriNova, Skunkworks, Unilever, Vatgia, VinaCapital, Vietnam National Broadcast Station, Vietnam Institute of Architecture, World Bank and Yola Institute, among many others. The year of 2014 witnessed VietAbroader‘s remarkable effort to innovate and implement many new events and initiatives in three fronts: Study-Abroad Resources, Community and Youth Development, and Business and Career. Please find below our Annual Report for 2014, which summarized our programs, personnel and achievements.